Home/News/Jupiter is in the headlines again…. With our company name being Jupiter, we always like to keep on top of news about our namesake planet. This week Jupiter hit the headlines after NASA released an intriguing picture taken of the giant planet’s turbulent atmosphere. It’s a fascinating shot of the North Temperate Belt of the planet – the largest in our Solar System and the 5th planet from the sun – which some says looks like a mysterious creature. The picture, which some reports have described as “stunning” and “breathtaking”, emerged this week after NASA’s orbiter Juno completed its 16th close flyby of the planet – it sailed just 4,400 miles away from it three weeks ago. Just some of the publications to cover the news includes the Smithsonian Mag, Astronomy Now, Space.com and the Mirror. 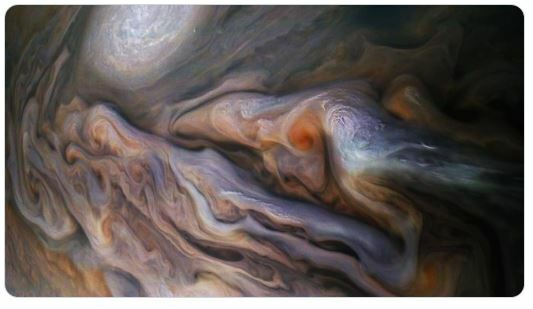 The Mirror newspaper states: “Jupiter has a storm that has created an angry-looking dragon eye within its mysterious and complex cloud systems. As with cloud-gazing on Earth, there’s a lot of interpretation to be done here. To help readers to see the dragon’s shape it goes on to highlight a post by Twitter user Astro Yuki who has drawn onto the image to depict how he reached his conclusion. While others having taken to social media to say they can see other creatures, like a dolphin. Well, whatever creature you make out in the picture of the complex, swirling clouds and anticyclonic storm surrounding Jupiter it’s an amazing revelation and a further insight into the galaxy that we are a part of and the world beyond Earth’s atmosphere. Back on solid ground, if you want to find out more about our exciting fresh produce world then you can find more about what we’ve been up to in our blog here, including news on our similarities with the planet Jupiter too. Jupiter fact: Did you know that Jupiter is so large that it’s two and a half times than that of all other known Solar System planets? Well, it’s true!